Art in Tibet is expression of the religion. It is regarded not as a work of art, but as a vehicle for expressing in a world of form the metaphysical concepts of religion. Most of the art in Tibetan religion or Lamaism is used for worship - the thangkas, images, votive tablets and ritual masks. There are many things such as metal works, jewelry, charm boxes, musical instruments and other objects which are used for lay purposes, but are decorated with religious symbols. The materials and techniques employed by the monks are described in the Tibetan religious books, the Kanjur, the translated commandments and the Tanjur, the translated explanations. 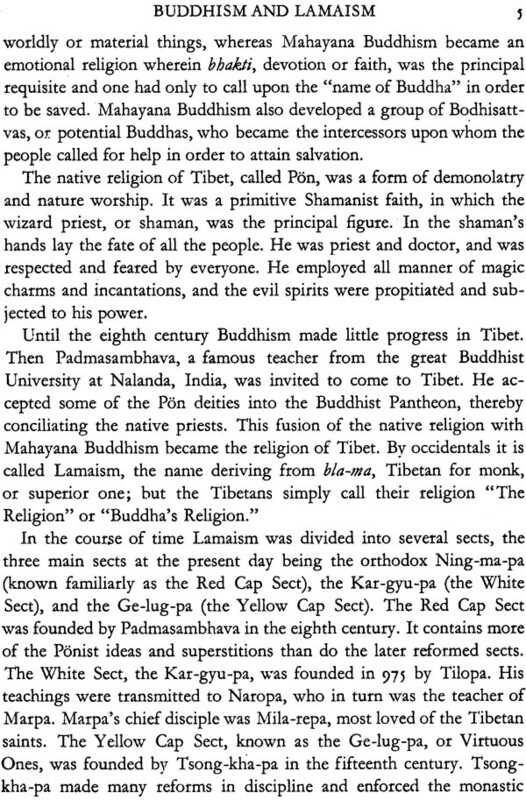 Tibetan Religious Art, first published in 1952 is a simple book that answers such basic questions concerning Tibetan art, its origins, functions and symbolism. 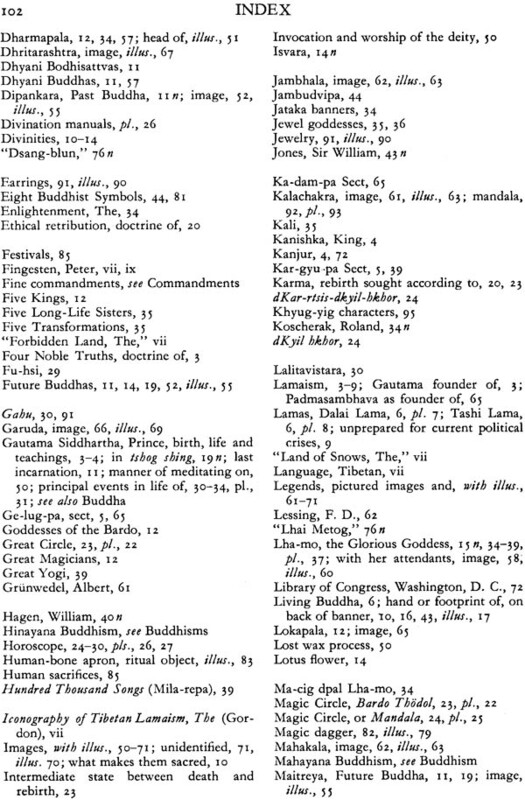 It was published at a time when, Tibetan canons dealing with the treatises on painting and sculpture were still not fully translated After all these years it still retains interest and authority. Antoinette K. Gordon, was the research associate in anthropology at the American Museum of Natural History. She made the study of Tibetan art and religion her life work. 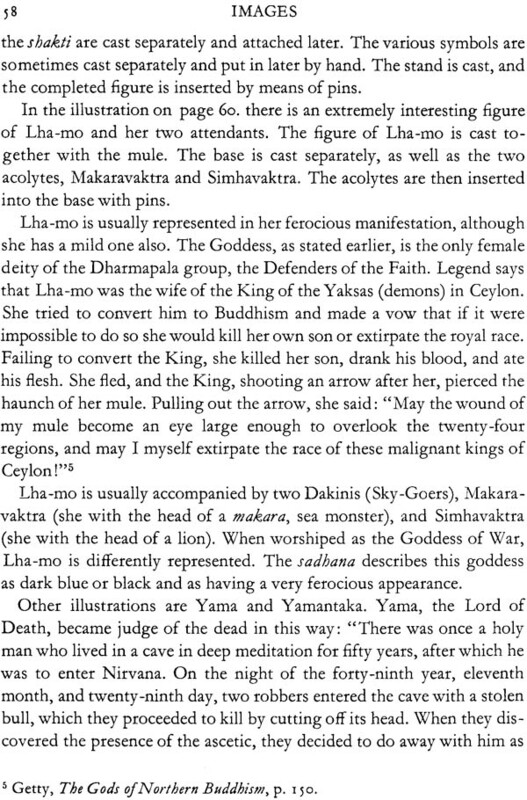 Her other works are: The Iconography of Tibetan Lamaism https://www.exoticindia.com/The Iconography of Tibetan Lamaism and Tibetan Tales: Stories from the Dsangs Blun. THE ARTS of China, Japan, and India have been familiar to the general public for many years, while the art of Tibet, "The Land of Snows," or "The Forbidden Land," is almost as remote as the country it- self. However, in recent years the interest in Tibet has steadily increased. 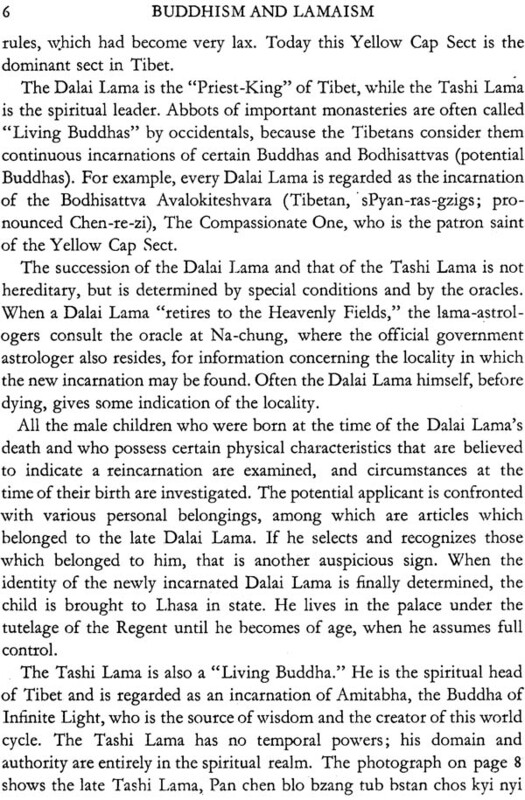 There has long been a need for a simple book that will answer questions concerning Tibetan art, its origins, functions, and the symbolism which is such an important factor. It is hoped that this book will answer that need to some extent. 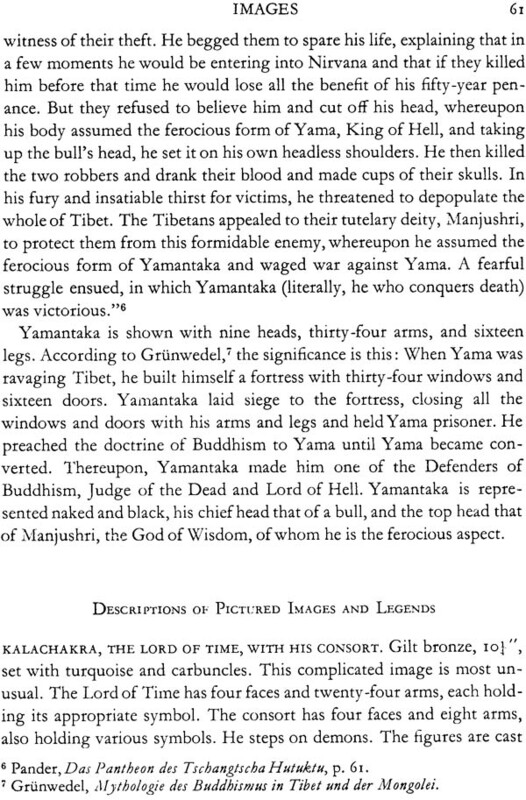 The favorable reception of my previous book, The Iconography of Tibetan Lamaism (1939), has encouraged me to make this material accessible to a wider public. 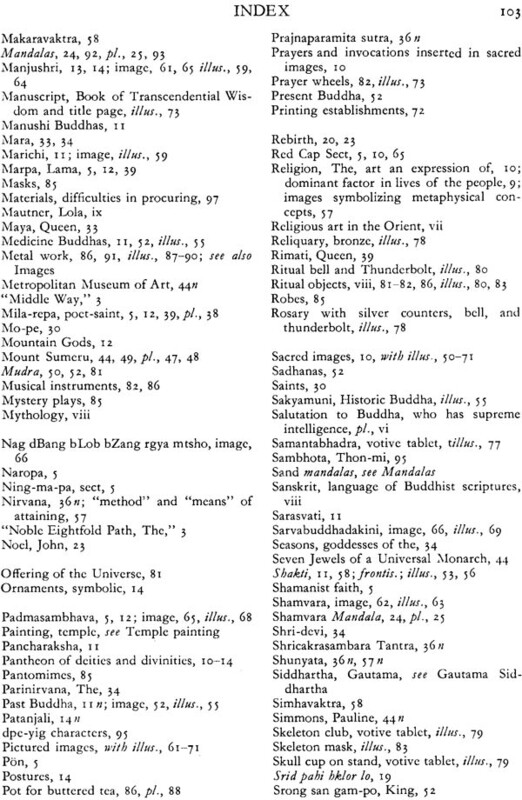 The time is not yet ripe for a thorough, comprehensive study of Tibetan art. 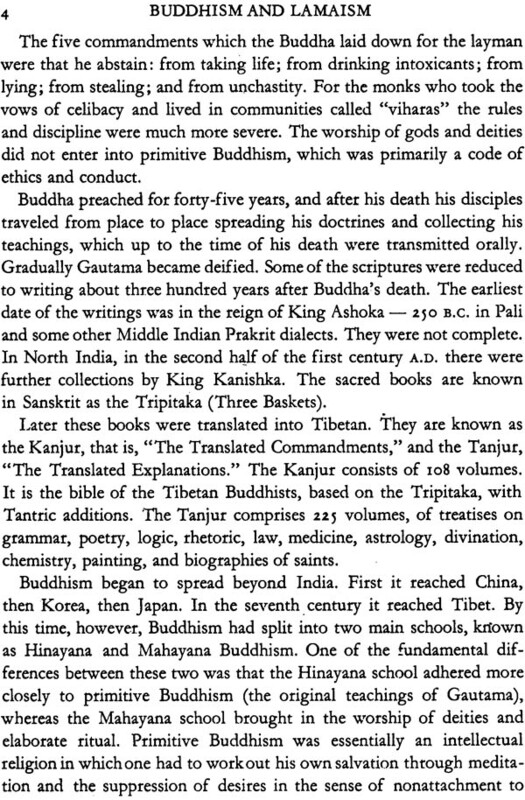 That time will come when those sections of the Tibetan Canon dealing with the treatises on painting and sculpture shall have been fully translated. The Tibetan language is a difficult barrier, because as yet there has been no standardized transliteration. Here, I have used approximate phonetic spellings wherever possible and omitted all diacritical marks. Tibetan art is essentially a religious art. Religious art in the Orient differs from that of the Occident in that the lama regards his work, not as a work of art, but as a vehicle for expressing in a world of form the metaphysical concepts of "The Religion." There has recently been offered an interesting distinction between "religious" and "sacred" art. Peter Fingesten, in his "Toward a New Definition. of Religious Art," College Art Journal, Vol. X, No.2, 1951, puts it this way: "Sacred art is canonical, liturgical, didactic, guided by ecclesiastic rules and intended exclusively for worship, and is anonymous; while religious art is inspired, free, individual and not necessarily intend- ed for worship." 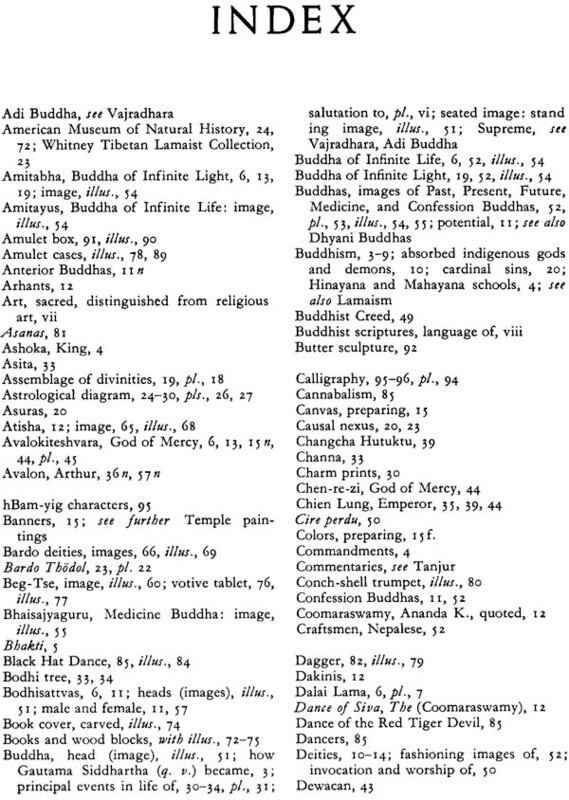 According to this standard, Tibetan art is primarily a "sacred" art. But I shall use the term "religious art" as being a broader term. 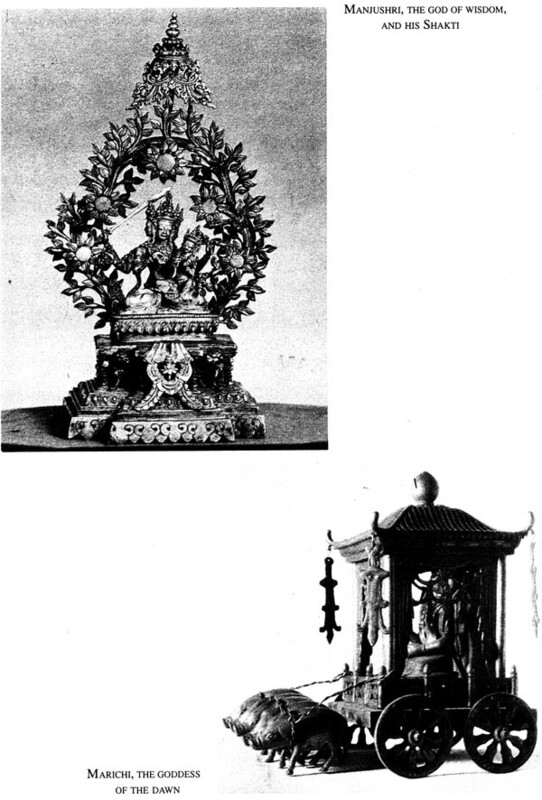 Most of the art was "sacred" and used for worship - the thang-kas, images, votive tablets, and books. There were many things such as metal work, jewelry, charm boxes, musical instruments, and other objects which were later used for lay purposes, but were decorated with religious symbols. 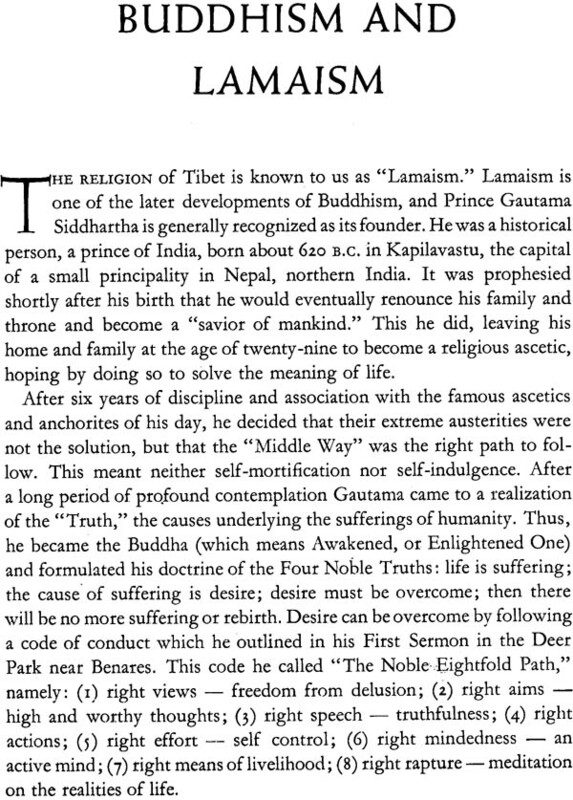 As the art of Tibet is based upon their religion, the first chapter is devoted to "The Religion". The objects used in the ritual were made according to canonical rules in the monasteries by the monks themselves or by artists traveling from one monastery to the other. For this reason there is very little free expres- sion in the handling of subject matter. However, a good painting by a competent artist may always be easily recognized. Materials and techniques employed by the monks are described in the text. The dating is controversial, as the objects were never signed by the artists, except in rare instances, when a painting or an image was made for a special votive offering, and an inscription and a date were inscribed. Sometimes it is possible to approximate dates by the colors and techniques used. 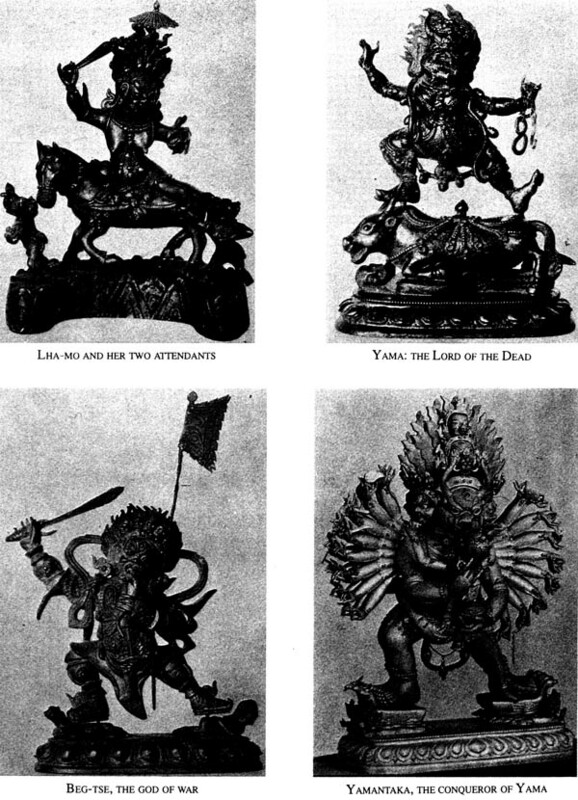 Tibetan art was influenced by India, Nepal, Persia, China, and Mongolia. In Southern Tibet, the Indo-Nepalese tradition prevailed; in the north, the influences came from China and Mon- golia. 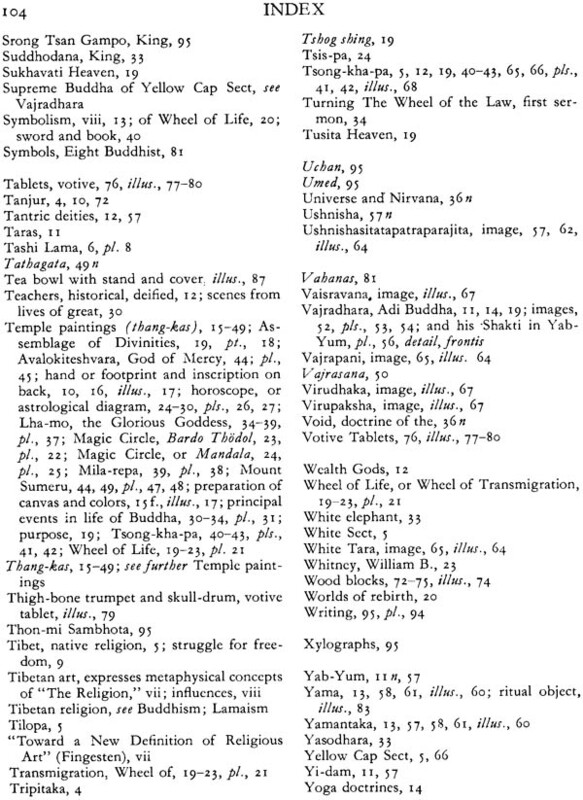 I have used the Sanskrit names and terminology in most instances, as Sanskrit is the language of the Buddhist scriptures, which were later translated into Tibetan. Unfamiliar languages and physical inacces- sibility may be barriers, but art is international and not circumscribed by country or political circumstances. Through the art of a country even as remote as Tibet we can come to an understanding of its people. By studying Tibetan art we establish a cultural bridge which will bring the Tibetans and their religion near to us in the West. The complex mythology is difficult for the student until he under- stands the symbolism and becomes familiar with the images. His com- prehension depends upon his desire to understand and his sympathetic approach. When the significance of the symbols is understood, the images become familiar and lose their strangeness. It is then that ap- preciation begins. My thanks are due to the many friends who requested this book and encouraged me in my work. I am especially grateful to Lola Mautner, whose questions and suggestions were most helpful, and to Peter Finges- ten for reading the manuscript and giving valuable aid.